Bay windows often are made up of three windows of varying sizes, typically featuring a large center window surrounded by two smaller windows. The two smaller windows, called flankers, are angled from the wall and are often double hung to give adequate ventilation. The large center window both adds to the ventilating capacity of the flankers and gives the homeowner an unobstructed view of the Pennsylvania outdoors. 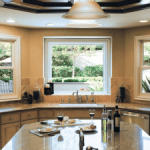 Renewal® bay windows are most often comprised of two double hung windows and a single casement window, but can also be designed using three separate casement windows. Each window we use to create your bay windows is designed with energy efficiency and lasting beauty in mind. The frames are created from Fibrex®, our exclusive, super sustainable material, and the glass is Low-E, meaning it limits the penetration of harmful UV and IR rays. Like all of the windows we install, your bay windows will be custom built to fit the specific room in your Philadelphia home. We offer a wide selection of colors and finishes for both the interior and exterior of your bay windows, and our design team will work with you to choose the right ones for your home. Whatever your home’s architectural structure is or your personal aesthetic goals are, we will guide you in choosing bay window products and design elements that are ideal for what you want to achieve. We also make sure that our team properly understands your requirements for your windows, so we can subsequently work toward their fulfillment. Prior to installation one of our window experts will come to your home and take precise measurements of your existing windows, taking note of any irregularities that might hinder our installation. This limits any mistakes and ensures that we finish your project on time and on budget. Once installed your new bay windows will be backed by industry-leading warranties thanks to our solid partnership with the national Renewal® by Andersen brand. In this way, you are assured of optimal cost savings, should you need additional repairs or replacements in the future. Are you ready to see how bay windows can help boost your home’s aesthetics and value? Call Renewal® by Andersen of Greater Philadelphia today at 610-563-2190 to schedule your FREE no obligation consultation with our Philadelphia area replacement window experts. Our knowledgeable staff will take you through the whole process so that you will gain a better understanding of the rewards of our services.